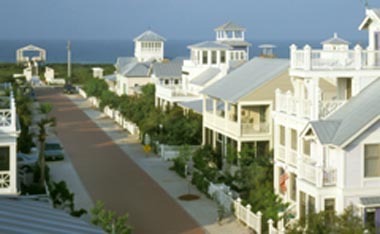 In 2002, when he was still the governor of Maryland, Parris Glendening invited a handful of Smart Growth leaders from around the country to join him for a three-day talk fest at Seaside, the famous Florida Gulf Coast resort community that served as the weirdly perfect set of the 1998 Jim Carrey film, The Truman Show. I attended the weekend, serving as the message and media guy for a gathering that also included Andres Duany, the architect and co-founder of the Congress for the New Urbanism, Bruce Katz of the Brookings Institution, Ron Sims, the executive of King County, Washington, Harriet Tregoning of the Maryland Planning Office, Don Chen of Smart Growth America, Angela Glover Blackwell of PolicyLink in Oakland, and Scott Bernstein, the founder and resident guru of the Center for Neighborhood Technology in Chicago. The conversation generally focused on how to collaborate in order to build a more secure and visible national movement around the principles and values of Smart Growth. We spent the days in an airy, light-filled, cream pastel drawing room on the second floor of a stunning Seaside home. It was early winter, but every day the sun shined warm and welcoming through arched windows. I swam in a pool as Caribbean clear and refreshing as a beach in Aruba. We strolled narrow streets shaded by palms and one breathtaking house after another. The setting encouraged fulsome discussion that focused on design and policy. How could we help communities get more comfortable with that marriage? When you put that many energetic activists of national stature in one room, and get them to relax as Seaside did, the atmospheric molecules vibrate differently. I had the clear sense that regardless of what came out of the intimate conference (and nothing really did) the days spent in active dialogue reflected the quickening intellectual energy that Smart Growth was generating across the country. A mode shift was underway. Some of the people who’d helped to make it happen had a rare three days to share ideas. The beautiful place where the event occurred served its part by proving that a new community, well-designed and carefully constructed, adds its measure of value to the human experience. Had the weekend unfolded in a windowless room in an edge city Marriott, nothing like the rich experience we all enjoyed could have occurred. This year Seaside marks its 25th anniversary, and the value of its homes and property are rising at a rate much faster than conventional Gulf Coast developments. It has grown more beautiful with age, and more durable. That is true in other New Urbanist communities, including The New Neighborhood in Empire, Michigan, near where I live. The New Neighborhood is an extension of Empire’s old neighborhoods, a short walk from the Lake Michigan shoreline. I learned this week that the New Neighborhood is selling more affordable lots and homes than any other development in Leelanau County. The New Neighborhood is one of a number of New Urbanist developments in this cold and snowy region of northern Michigan. The fact that they exist at all owes almost everything to Seaside’s successful design, construction, and marketing of a new idea in a warm, blue, and sunny place more than two decades and 1,000 miles away.